What is the item? 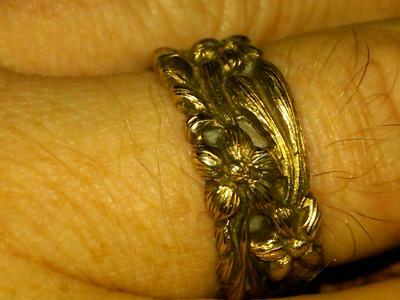 Art Noveau men's ring (circa 1920 according to antique jewelry dealer) featuring intricate flower/vine pattern. Band is perforated between vines/flowers in some places. Bought from an antique jewelry dealer in Savannah, GA.
14K (I realize this refers to 14 karat) The other marking is the mystery; NW These two markings are the only ones to be found on the ring.